Here is a picture of the boys in my Den. Den 8 is great!! 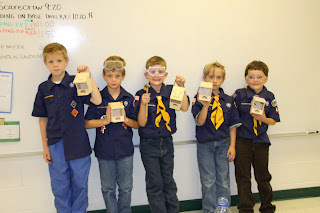 This is right after they finished their squirrel feeders we built at our last meeting. Those are just like the ones we made at Lowe's build and grow......oh that picture brings back memories of Cam Cam when he was a scout! Thjey are all so cute!